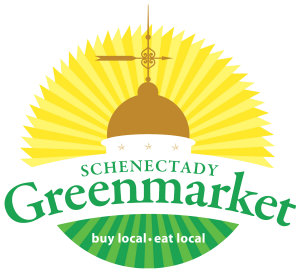 Schenectady Greenmarket connects farm and city to create a responsible, sustainable food system–right in the heart of downtown. Each Sunday from 10am—2pm, vendors, shoppers, musicians, and friends gather to purchase fresh local produce and artisan goods in a festive community marketplace. Our outdoor market is located around Schenectady City Hall from May through October, with more than seventy local vendors who produce everything they sell. EBT, credit and debit cards accepted. A true farm-toglass operation, growing and distilling potatoes on Barber’s Family Farm for our 1857 Potato Vodka. Fresh, homemade, tahini-free hummus, bean dips, tapenades and salsas. Handcrafted small batch wines made from estate-grown grapes. Also offering table and jelly grapes. Handmade jewelry featuring semi-precious stones from around the world. Cut flower and floral design farm that provides seasonal, high quality, locally grown blooms fresh from our fields using only organic methods. Small batches of responsibly sourced specialty coffee for wholesale clients and our own webstore. With the firm belief in the benefits of a vibrant farmers’ market community, Assembly has chosen to retail exclusively at area farmers’ markets. We believe that great coffee should be approachable, fun, and excessable to all. Hard cider using 100% NYS Apples in all of their creations. We have a variety of flavors that range from dry to sweet. A wide selection of high-quality fruits, vegetables, beans, herbs and plants. Low and no spray. No GMOs. Fresh milk, cream, half and half and ice cream from the Battenkill Valley herd. Free of bovine growth hormone. All natural meats, sausages and smoked items. Fresh produce, herbs and more. Produce frown from non-GMO seeds and without chemical fertilizers, pesticides or herbicides. Basil-parsley pesto made with the freshest and finest ingredients. Rooted in Schenectady County, a family farm offering fruit, vegetables and annuals. Indigenous plants grown from seeds responsibly collected from wildflowers within 100 miles of the Capital District. A diverse family farm offering flowers. Low input, no/low spray produce includes heirlooms, flowers, maple and fresh brown eggs, range raised hens fed non-GMO corn. Locally roasted fresh coffees curated from around the globe. Mediterranean dishes including spanakopita, stuffed peppers and more. Ready-to-eat and made using local produce when in season. Made-from-scratch casseroles, quiches, pies and more. Frozen and ready to prepare for weeknight dinners. Hummus with chickpeas, fresh garlic, lemon juice, extra virgin olive oil and fine spices. Quality baked goods made from scratch using estate and locally grown ingredients whenever possible. Unique gourmet granola products made in Schenectady using the finest ingredients. Prepared jams, salsas, sauces and healthy snacks made without added sugar. Cut flowers and flower arrangements from the Goblet family’s 350-acre farm. Pasture-raised red deer venison and antler chews for dogs. Certified naturally grown vegetables and herbs. Whole grain breads, muffins, scones and cookies promoting healthy eating without compromising taste. Peruvian cuisine including empanadas, fried plantains and picarones. Beautiful, nutrient-dense and super fresh micro greens, mixed produce. Homemade ready-to-serve dinners, pastas and more. Using fresh and, when available, organic ingredients from local farms. All-natural humanely-raised pasture meat. No antibiotics or hormones. Nitrate free. High quality specialty and gourmet mushrooms. Specializing in Shiitake and Oyster mushrooms. Offering a wide array of fruits and vegetables. Unique mosaic tables, stepping stones, wall hangings, chess sets and more. Exceptional ready-to-eat breakfast pastries and sandwiches. New York’s first farm cider featuring a variety of off-dry ciders sourced from Capital Region and Hudson Valley orchards. A local beekeeper that prides itself as the best local source of honey available. Artisan baked goods from all natural ingredients baked from scratch daily. All natural goat cheeses and yogurts made only with milk from the Painted Goat Farm. Specialty nut butters, seed butters, fluff, salad dressings and more. Lacto-fermented pickles, sauerkraut, kimchi and more. Made with old-world pickling techniques using natural and local ingredients. Wild-caught fresh New York State seafood and prepared items. Handcrafted artisanal cheeses and yogurts made with quality milk in small batches. Healthy all-natural dog biscuits handmade with wholesome ingredients like sweet potatoes, fresh local eggs, and locally grown apples. Root 162 Farm and Processing Co.
Grass-fed beef, pasture-raised pork and poultry products. Family farm growing tree fruits, small fruits and vegetables using rocks dusts, sea minerals and organic fertilizers. Apples, cider and hard cider available. All-natural peanut butter and almond butter blends made in small batches. Family-owned and operated farm producing maple syrup, honey and lavender products. Beautiful and functional stoneware pottery handcrafted in Schoharie County. Distilled spirits made from organic fruits and grain including vodka, gin, moonshine, whiskey, flavored vodkas, liqueurs, cordials, and infusions. Ready-to-eat Indian cuisine made with specially-ground homemade spice mixes. Hand made artisan soaps inspired by nature – specializing in olive oile based soaps, hand and foot scrubs, lotions, bath bombs and gifts. Fresh, local and healthy vegan prepared foods with custom soups, salads, healthy shakes, sauces and spices. NOFA-certified organic herbs, greens and vegetables. Also cookies, cakes, potpourri and Island Tea. Farm-fresh goat milk, cheeses, and yogurt. Also goat milk soap and lotion. Distillery making whiskey and other spirits from local farm products.